Reduce the labor and downtime required to clean your conveyor chain with a SpanTech chain washer. Take on the hard jobs and gets them done right. The Chain Washer solution is ideal for non-washdown environments. This clean-in-place chain washer is a built-in, enclosed unit designed to reduce the labor and downtime required to clean conveyor chain. Our chain washer is capable of removing difficult materials such as dried-on icings, glazes, batters, toppings, and fillings. The conveyor’s return chain enters the unit housing and passes through a wash zone. Nozzles direct pressurized water onto the chain to remove debris. Then pressurized air from the internal air nozzle removes most of the water from the chain before it leaves the housing. Chain cleaning normally takes place during breaks in production. Since it operates automatically, this unit provides the user with a more reliable method of ensuring that the chain is totally cleaned. Drip trays at the entrance and exit of the washer itself capture most of the water lost from the unit. 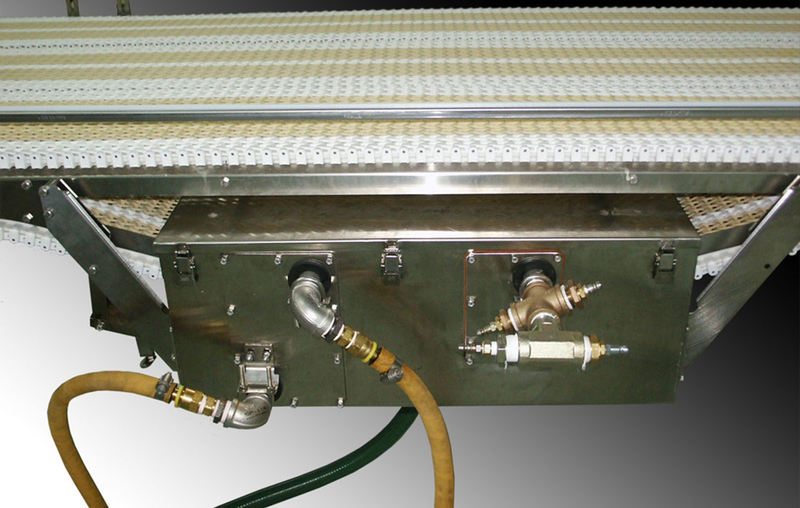 The small amount of water that is not removed by the air nozzles can be captured in optional drip trays mounted under the drive and idler of the conveyor. The CIP unit can be used with any of the Designer System® conveyor chains, except cleated or tube top chain patterns.